Pon especial cuidado al darle la vuelta al crujiente en la sartén para no quemarte, y asegúrate de que esta es antiadherente. An easy receipt but with a creative touch. 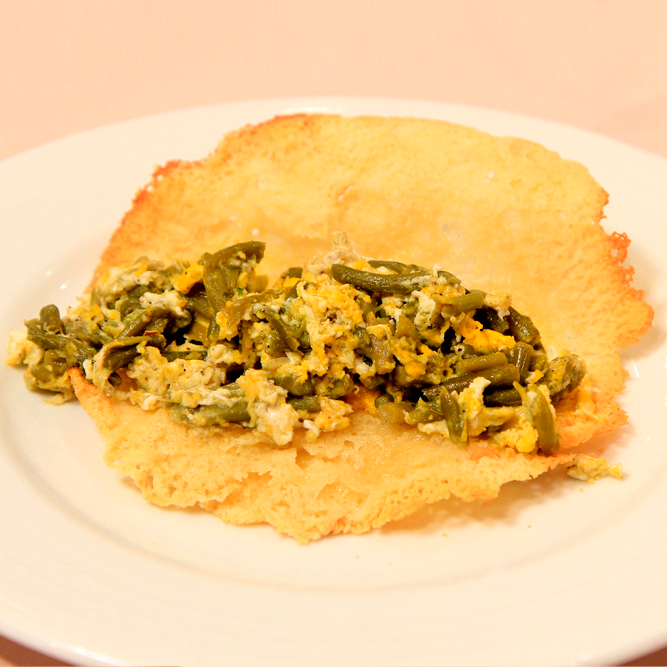 The scrambled eggs lie on a colorful crunchy torta cheese with will give this dish an outstanding place on the table. Ingredients: Tender garlic, torta cheese, mince salad with garlic and parsley, 2 eggs, olive oil and salt. Pay attention and turn the crunchy torta cheese in the pan in order for you to not get burnt, and be sure that the pan is a nonstick one. * Torta cheese is from Extremadura, in Spain. Really delicious and creamy.